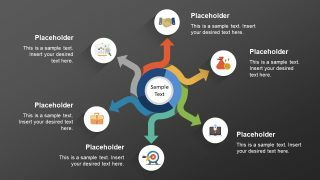 The 6 Step Business Concept with Arrows for PowerPoint is a spoke diagram design. The spoke diagrams can present network and subprocess concepts with a core element in middle. 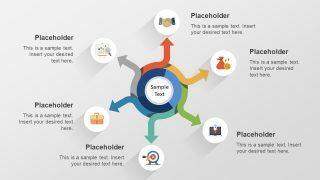 This spoke diagram of 6 steps business concept is a multi-purpose layout. And, subsegments of this diagram display flat shapes as infographics. 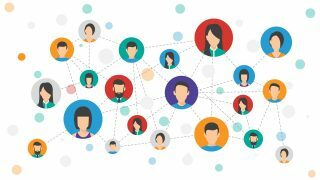 These infographics are high-quality images such as handshake, money bag, rocket launch, dartboard target, briefcase, and trend chart. But users can replace these icons with shapes or images relevant to their presentation topics. Moreover, the colorful arrows illustrate a network spreading from center to 6 circular icons. These arrows also show the direction of processes, which is customizable via rotation feature for shapes. Hence, it is an attractive PowerPoint to demonstrate 6 stages, processes, or spoke processes. The 6 steps PowerPoint diagram shows a connection between core and sub-elements. Each of these elements is distinguishable through colors, images, and connecting arrows. 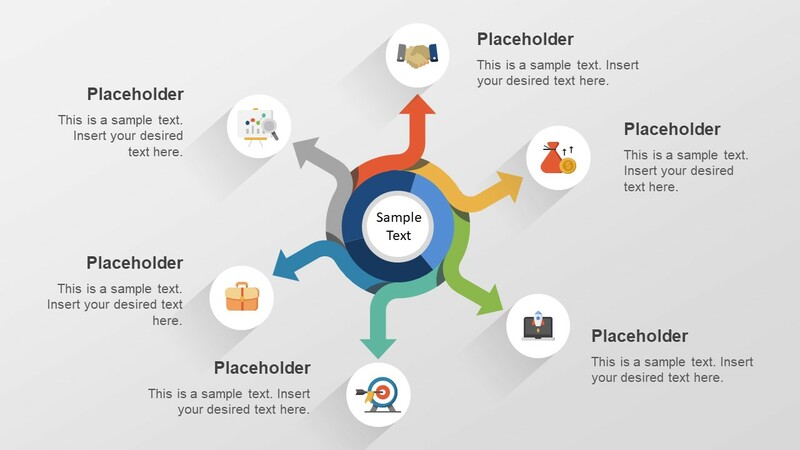 Ideally, in marketing strategy presentations, the spoke diagram can demonstrate 6 channels to approach potential customers. Or, discuss core competencies of business in 6 steps diagram template. 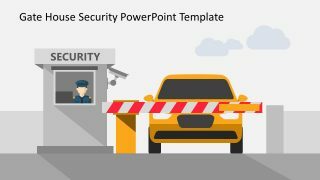 The 6 Step Business Concept with Arrows for PowerPoint is an editable template. Therefore, user can change the colors, shapes, sizes and much more. The images inside circular units are flat vector images, therefore, changing design properties will not affect picture quality. Furthermore, there are two assorted backgrounds i.e. white and black. 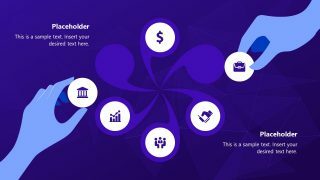 The users can choose any slide template according to light or dark color theme of existing presentation. 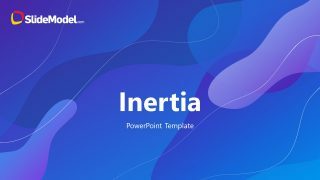 Simply copy the desired slide layout with few adjustments in design and text.